Currently trading in Chapter 11, and the subject of various takeover rumours American Airlines has announced an investment of several hundred million US Dollars to redesign and refresh the airline’s international wide-body fleet. All of American’s Boeing 777-200ERs will be redesigned to a two-class cabin configuration to better match capacity and demand. 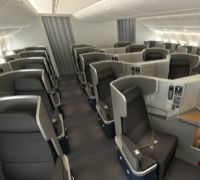 The aircraft cabin will feature unique mood lighting and a dramatic archway and ceiling treatment to create a feeling of spaciousness similar to the airline’s new 777-300ERs, the first of which American plans to receive later this year. A Business Class stand-up bar, stocked with snacks and refreshments, is for premium customers. Wi-fi will also be available in-flight. American intends to retrofit up to half of its existing 767-300ER aircraft. 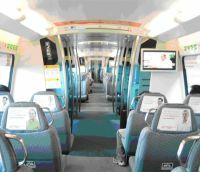 Those that are redesigned will operate the new configuration with fully lie-flat Business Class seats and all-aisle access. The remaining 767-300ERs that are not redesigned will be retired over time. Passenger numbers through BAA’s airports in April totalled 9.1m, a 0.1% increase on the same month last year. Year-on-year comparisons are complicated by the timing of Easter so combining March and April traffic reveals a year-on-year increase of 1.9%. For Heathrow the figure was 5.8m, marginally up on April 2011, but another record month for the airport. Heathrow’s load factors continued to increase, rising 0.1 percentage points in April, to 76.4%. The average number of seats per aircraft was also up, rising 1.1% to 197.6. This can be explained by the airlines better use of capacity and the increasing number of Airbus A380s now in the schedules, usually replacing a smaller Boeing 747. Cargo movement was down 1.1% across the group and 2.5% at Heathrow, in line with the global economic climate. 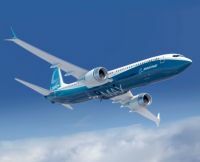 With total 737 sales edging towards the 10,000 point (9,375 orders and 7,010 delivered) Boeing is pressing on with the development of the latest incarnation, the MAX. 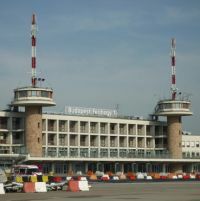 Following the collapse of the national airline Malev, Budapest Airport will move all airline operations from Terminal 1 to Terminal 2 during the night of 29-30 May 2012. From 30 May 2012, all easyJet, Germanwings, Jet2.com, Norwegian and Wizz Air passengers will depart from Budapest Airport’s Terminal 2B. Passengers flying on these airlines will arrive at Terminal 2A (from Schengen countries) or at Terminal 2B (from non-Schengen countries). In a statement the airport company said that following the demise of Malev it has no other choice but to reduce costs by combining operational areas, and make the best use of the infrastructure at the more modern Terminal 2. British Airways is to introduce a new service from London City Airport to the Isle of Man. The airline will operate a single flight from Ronaldsway to the dockland airport from 28 May. This will increase to three services weekly daily, one on Saturdays and two on Sundays from 25 June. The operation will be flown by a Eastern Airways single class Saab 2000 under a leasing agreement that includes flight deck and cabin staff all of whom work in BA uniforms. In another move CityFlyer is to withdraw its twice daily flights to Copenhagen from 24 May but it is hoped that Sun Air will resurrect the route in September using the smaller (32 seats) Dornier 328 jet. Sun Air flies from LCY to Billund. Myanmar and Iraq are among the highlights of new routes announcement by Qatar Airways, emphasising Doha as the hub to and from Europe. Scheduled flights to Iraq will begin on 23 May with Erbil in the north, followed two weeks later by services to Baghdad on 7 June. Each route will be served with four-flights-a-week non-stop from Doha. Effective 25 July, the airline will launch flights to Kilimanjaro, its second gateway in Tanzania. The daily services operate via Nairobi. 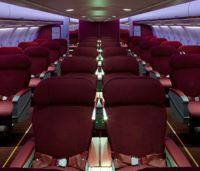 Beginning 15 August, Qatar Airways introduces its third African destination of 2012 with the introduction of services to Mombasa. Each of the daily flights will operate via the Tanzanian capital Dar es Salaam. In March, Qatar Airways began flights to Rwanda’s capital city of Kigali, the carrier‘s first African route of the year. Readers are reminded that submissions to the All Party Aviation Group (APPG) inquiry into the competitiveness of the UK’s aviation industry have until 16 May to make their written submissions. AERBT has submitted its suggestions backing Northolt. Forget all this business about the problems at what was Immigration and is now called Border Control. In truth the British love to queue. The real idea is to train foreigners on what to expect once they have passed the airport gatekeepers. The row regarding UK Border Controls lingers on. 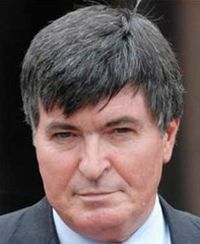 With the Olympics now only weeks away it is imperative that Government sorts out the whole issue as quickly as possible. This has been acknowledged by Whitehall. (see Justine Greening below) Your Editor has travelled through Gatwick (16:00), Heathrow (06:00) and Luton (18:00) with little or no delay. At Gatwick on a deserted mid-afternoon the electronic machine failed (“it's rubbish” according to a member of the staff). But there have been well documented serious problems with them. Since immigration and customs were brought under a single uniformed force in 2008 border control procedures have deteriorated. Is it time to re-visit this vital area? The coalition can always blame the previous administration. The UK Border Agency has a staff of 23,000 people located in over 130 countries. The agency plans to reduce this by around 5,200 between 2011 and 2015. Its current budget is £2.2bn. It is a profitable organisation with the airlines contributing £2.5bn this year and £3.5bn by 2015 by virtue of Air Passenger Duty (APD). The ports and trains, which also make use of its services, do not contribute a single penny. What is not so well publicised are the additional sums generated by visa applications. If you are from Australia or the US you do not need a visa for a holiday visit, but if originating in Jamaica and South Africa, both members of the Commonwealth, you do. This is also a major impediment for travel to the UK from many parts of the world. The total number of visits to the UK by overseas residents last year rose from 29.6m to 30.6m, according to the Office for National Statistics (ONS). Non-European and non-American visitor numbers increased by 12% to 4.7m – experts believe that this group consists mainly of visitors from China. For a six month visa the current cost is £78. AERBT asked the Treasury how much this generated in a year and were told it was a Home Office figure. Three calls to the press department were not returned. We think that visa applications generate about £0.5bn. It could be more. We can only surmise and expect our figures to be disputed. Because of the difficulties in obtaining a visa the numbers are not what they could be. The agency says that it will decide 90% within 3 weeks, 98% within 6 weeks and 100% in 12 weeks. Visit the Chinese visa section at London’s Holborn and you will get your passport back in three days. Even Kazakhstan is not much slower. According to the Border Agency the cost of each passenger processed at the point of entry is £3.25. For all passengers the APD outbound charge is £65 minimum in, typically, the 2,000 mile band. Frankly APD and the visa levy is a modern version of the Sheriff of Nottingham’s taxation. You could add the European eco charge too. Whether Willie Walsh and Carolyn McCall could be considered Robin Hood and Maid Marion flying the flag for the consumer is a debatable point but they are at least keeping pressure on what is frankly a robber government. An increase of staff is a quick remedy. If air travel generated, say, £3bn in 2011 by way of direct taxation some of it must be put back urgently starting with an increase in border check personnel. We want visitors to come to the UK after the Olympics too. With Hartsfield-Jackson Airport due to open its new international terminal airport this week (see AERBT next Monday) the city of Atlanta has celebrated the introduction of a Mandarin Oriental hotel, only the seventh US property of the worldwide luxury group. Sited in the city’s prestigious Buckhead neighbourhood and housed in an iconic building designed by celebrated American architect Robert A. M. Stern, the new Mandarin Oriental, Atlanta is essentially a boutique hotel with just 127 spacious rooms and suites. Passengers to Berlin after 3 June, and who thought that they would be going to the new Brandenburg airport, should be aware that Tegel Airport is to remain the city’s main gateway until at least into the autumn. Described as “technical problems” and thought to be fire safety issues, the new showpiece operation will not open on schedule. No date has been confirmed for the change-over. 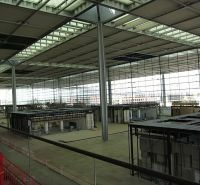 Matthias Platzek, head of the Brandenburg government, told the daily Tagesspiegel that the opening is now planned for the second part of August. The delay creates additional costs of €15m per month. “A big opening ceremony (with 10,000 guests) will not happen anymore. We have no reason to celebrate,” he said. Aer Arann, flying on behalf of Aer Lingus, has introduced a six-day per week service from Bournemouth to Dublin. This new route follows closely the opening of a service between Southend and Dublin. Flights from Bournemouth depart at 16:20 while the afternoon service from Dublin departs at 14:30 and takes around 1hr 20mins in an ATR72. With this schedule the flights do not allow for a direct connection to the various Aer Lingus North American destinations from Dublin, but as the airline points out Heathrow is 90 miles away and has parking problems which probably means a night-stop in any event. For flights booked out of Dublin the tax is only €3. The 12th annual EBACE European Business Aviation Convention opened today (Monday 14 May until Wednesday 16 May) at the magnificent Palexpo within the Geneva International Airport terminal building, with record numbers expected. “It is going to be the biggest show to date,” said EBAA Chief Executive Fabio Gamba, confirming over 11,000 visitors have pre-registered with 491 exhibitors, 17% up on 2011, taking over three halls of the Palexpo venue. bmiBaby’s demise may have been bad news for the airline and its staff but it has certainly offered an opportunity for Luton-headquartered Monarch. The airline has established a base at East Midlands Airport, formerly the centre of bmiBaby’s operations. On 18 May it puts on sale a whole cluster of routes previously flown by its rival. 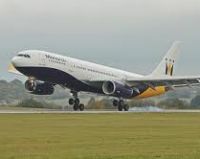 Monarch is for the most part a leisure market airline although it does carry a proportion of business travellers. It says that its new services will account for a quarter of Bmibaby’s existing routes from the Midlands. The routes include new flights from East Midlands to Alicante, Faro, Malaga and Palma, plus additional frequencies from Birmingham to Alicante, Faro, Malaga and Palma, whilst Barcelona is introduced. Monarch was founded in 1967 and has grown to be a scheduled service and charter airline which last year carried 5.9m passengers. A demonstration tour of South East Asia by the promising new Russian Sukhoi Superjet has come to an aborted finish with the aircraft crashing in Indonesia. All on board were lost including senior people from the manufacturer, local politicians, media and industry representatives. The operation is marketed as Superjet International and is a joint venture between Alenia Aermacchi (51%) of Italy and Sukhoi Holding Company (49%) of Russia. 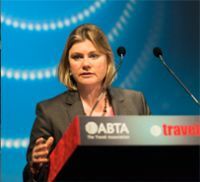 The Millbank Media Centre, Westminster, was the venue for ABTA’s annual Travel Matters forum, with the great and the good from the industry turning out. Keynote speaker Justine Greening MP, Secretary of State for Transport, is clearly warming to her new role but in truth she had very little to say, acknowledging that the current queuing problems at passport control at Heathrow and other UK airports was “a problem that needs to be fixed.” Ms Greening was responding to questions from the floor following the release of a report highly critical of the level of service provided by the UK Border Force. The Minister, not for the first time, ruled out the option of a third runway at Heathrow and permission for mixed mode use of runways where runways can be used for both take-off and landing. Nine bmi destinations are to change from a bmi (BD) to a British Airways (BA) code and flight number from 23 May. Passengers booked up to 10 May will be able to use the bmi baggage allowances. But all other British Airways policies, including those relating to check-in times, medical clearance, children travelling alone and customers travelling when pregnant will apply to any bookings moved from a BD to BA code irrespective of when they were booked. The changes will affect bmi flights to and from Agadir, Basel, Bergen, Casablanca, Hanover, Marrakech, Nice, Stavangar and Vienna. The flight schedule, including time, date and terminal, will remain the same, it is simply the code that is changing. British Airways plans to operate bmi’s summer schedule to and from Heathrow. Customers who have booked directly with bmi will receive an email advising them of the new flight number. They should check-in online at ba.com and travel as normal. Customers booked through a travel agency should contact them directly if they have any questions. International Airlines Group (IAG) has signed a binding agreement to sell bmi Regional. Aberdeen-based Sector Aviation Holdings Ltd (SAH) is the purchaser with the price published as £8m in cash. The sale includes all bmi Regional's fixed assets and long-term liabilities, including owned and operating lease aircraft. As predicted in last week's AERBT a third party airline has got involved, Loganair. 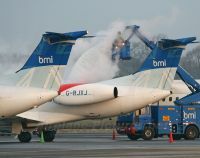 bmi Regional operates a fleet of 18 Embraer regional jets on scheduled services throughout the UK and Northern Europe. OpenSkies, the French subsidiary of British Airways, is adding a new ‘Eco’ cabin class to its aircraft and dropping its Business Class only configuration. 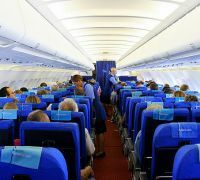 Its aircraft remains the single aisle Boeing 757-200. The airline flies twice daily between Orly Paris and Newark New York. 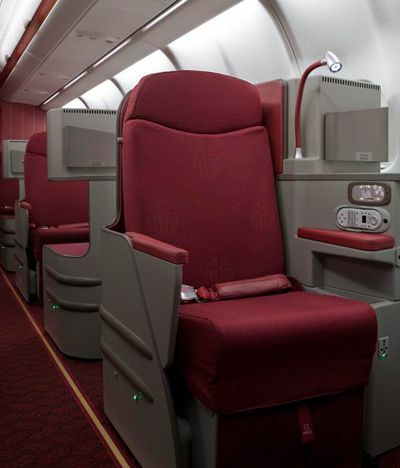 Beginning 19 June OpenSkies will operate with ‘Biz Bed’, 20 seats lie-flat Business Class, 28 seats ‘Prem Plus’, a traditional cradle offering, and 66 leather seats in what is termed ‘Eco’ Class. Finnair has begun flying direct to Chongqing, one of the largest and fastest-growing cities in China. 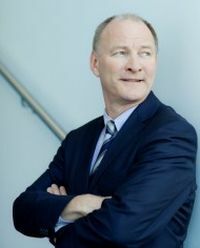 The new route is a logical next step in the carrier’s strategy of offering the shortest connections between Asia and Europe via Helsinki. Finnair is the first carrier to open a direct flight route between Europe and Chongqing. Situated on the edge of the Tibetan plateau, greater Chongqing is one of China’s four province-level municipalities, and the only one located in inland China. With a total population of 32m residing in an area about the size of Austria, Chongqing’s urban population is expected to double over the next five years. 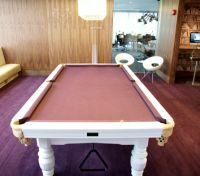 London City Airport’s executive centre, in line with Biggin Hill, says that there are still plenty of slots available for the period of the Olympic Games but these are likely to be taken up, although they are on a first come first served basis. The private jet base is totally separate from the main terminal with its own security and lounge areas. The airport’s largest operator, British Airways CityFlyer, reports that bookings for the period are running at normal levels but expects a rush for seats as the event gets closer. 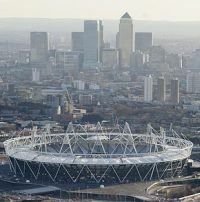 Besides the Olympic Park itself, London City is the nearest airport for Excel (boxing, fencing, judo, table tennis, taekwondo, weightlifting and wrestling), Millennium Dome Centre (artistic gymnastics, basketball final and trampoline), the equestrian events at Greenwich and even the beach volleyball at Horse Guards Parade. Via DLR to Canning Town and the Jubilee Line, Westminster Underground, the nearest station, is just 30 minutes, much nearer than Heathrow. Avis is to make available the widely acclaimed Volkswagen Golf Cabriolet for hire through its premium Select Series range. Launched by Volkswagen in September last year, this is the first time that the impressive Volkswagen Golf Cabriolet will be available to hire in the UK. 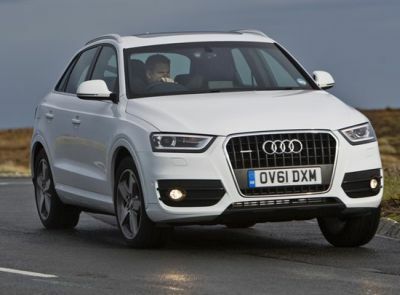 With the Avis ‘Select Series’, customers can choose the make and model of their hire car at the time of booking, appealing to motoring enthusiasts looking to hire a specific vehicle. The Volkswagen Golf Cabriolet is the first soft top vehicle on the scheme and will join the Audi A4, Audi A4 Avant, Audi A1, Alfa Romeo Giulietta, BMW 5 Series, BMW 1 Series, Fiat 500, Volkswagen Scirocco, Volkswagen Sharan, Volvo XC90, Citroen DS3 and the Volkswagen Golf BlueMotion.